To catch another of the Neuhof bandits, Henry has to live the humble, disciplined life of a Benedictine monk – at least for a little while. Here’s how to complete the Needle in a Haystack quest, including where to find Pious and get out of the monastery unscathed. Due to the nature of the quest, it’s difficult to give instructions on how to finish it without being explicit about who you’re looking for, so beware of spoilers. Needle in a Haystack can be tackled in many different ways but, because of the restrictions placed on monastic life, can be a real chore. This guide goes through a relatively quick, but non-lethal method of completing the quest – which is suitable for the Merciful trophy, but NOT the Completionist trophy. This method will cause you to fail the Nasty Habits quest. If you want to complete that, then you’ll have to stick around in the monastery and adhere to your schedule for a few days longer. As soon as the Poverty, Chastity and Obedience quest ends, you’ll enter a conversation with Novice Antoninus. Depending on your patience, you can either go on a tour of the monastery with him, or just say that you’re not bothered – it doesn’t matter. Either way, when you’re done speak to Antoninus again immediately. Confide in him that you’re on the trail of a criminal in the monastery, and when he asks what you’re going to do with the man in question, say you’ll kill him. Following the conversation, go about your day until meal time. After a few bites, you’ll fall ill and black out from poison. When you come to you’ll be approached by Antoninus, who admits to being Pious and proposes a deal. Since you’re both trapped in the Monastery, he offers to partner up with you to escape. To get out, you’ll need some keys and some blood to fake a scene. Agree to the deal. Now depending on the time, either go back to sleep until night time or head downstairs to the kitchen. At night, there should be no one around to see you, but crouch to make sure. Go to the kitchen at the back of the meal room you visited earlier. As you walk in, you should be able to interact with the shopping list on your left. This orders the blood to be delivered. Then go through the door in front of you into a storage room. Then walk forward and through the other door in front of you. Turn right and go to the very back of the storage room. There should be a shelf filled with food here. On the right hand side, of the top shelf, there should be the monastery key. It’s an item that you pick up, rather than opening the shelf. Then head back upstairs and sleep until it’s time for Mass (4am). Go downstairs and wait in the church for two hours until it’s time for breakfast. Now run over to the meal room and stealth into the room where you wrote on the shopping list. There should be a container of goat’s blood on the table you interacted with last night. Sneak back into the meal room and sit down to eat. Now’s the time to be careful, if you fall foul of the monastery rules one of the senior monks can reprimand you and confiscate any items you shouldn’t have. Unfortunately, this includes your quest items and can make the game crash during the next step. Finish eating with everyone else – you can wait to pass the time – then speak to Antoninus in the corridor. Tell him you’ve procured everything you need to escape. He’ll tell you to meet him in the dormitory after evening mass (6PM). You’ll have to work through the day to avoid trouble until then. If you’re having trouble finding where to go, open you quest journalism and track the monastery side quests. These will give you map markers for where you’re supposed to be working. First up is potion making, which you can treat as a good excuse to gather some alchemy XP. Brother Nevlas will ask you to make a basic potion, so follow the instructions in the book on the alchemy station in the next room. When the instructions say to boil something, you have to press the left trigger (L2) until there are black smokey bubbles coming off of the cauldron. When you see these, stop, because it’s possible to boil over. The quality of your work doesn’t really matter, so when you’re done just take what you have to the monk and wait until your next shift (12PM). Now go to the library upstairs, and speak to the librarian. He’ll ask you to copy some latin texts. Again, the quality of your work doesn’t matter. So you can try and match the option to the text on the page, or you can get it over with. Next, wait until meal time (4PM) and then go downstairs. Eat, then wait until 6PM and go and meet Antoninus in the upstairs dormitory. He’s waiting on the balcony. When you meet Antoninus, it’ll trigger a cutscene where he fakes a crime scene. Then you’ll regain control to walk over to the exit and outside. When you’re clear of the walls, Antoninus will talk to you. Now you can let him go, or say you’ll take him in for questioning. If you try to take him in, it’ll start a fist fight. 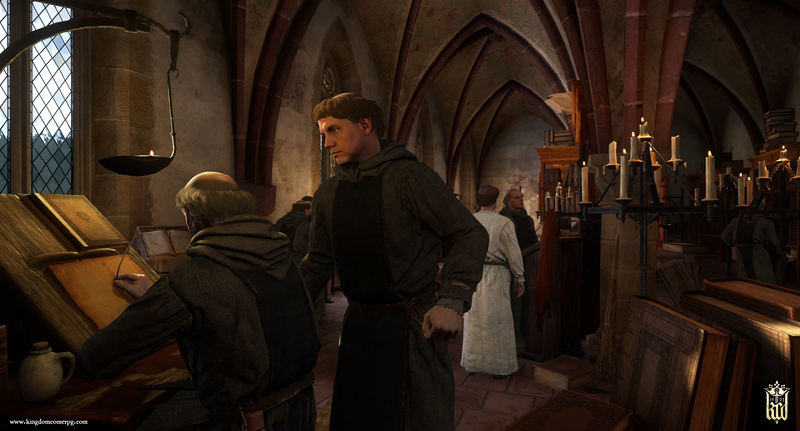 When you’ve laid the beat down, you’ll fast travel to Rattay and finish the quest.